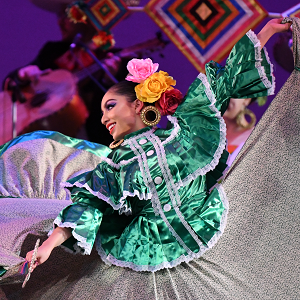 Fiesta Mexicana celebrates Mexico’s rich folk music and dance traditions with a vibrant, colorful performance featuring Ballet Folklorico Mexicano de Carlos Moreno accompanied by Mariachi Colima de Javier Magallon. Founded in 1967 by Carlos Moreno, the Ballet Folklorico Mexicano has achieved recognition both in the United States and in Mexico. Drawing on the artistic variety of Mexico’s different regions, Ballet Folklorico Mexicano has a diverse repertoire ranging from traditional dances to dances integrating artistic elements of more contemporary choreography. Accompanying Ballet Folklorico Mexicano is San Francisco Bay Area band, Mariachi Colima. Performing for over 25 years, Mariachi Colima has accompanied many prestigious Mexican singers, including Lucha Villa, Valente Pastor, Rosenda Bernal, Aida Cuevas, Lucero, and Pedro Fernandez. Together, Ballet Folklorico Mexicano and Mariachi Colima will take you on a tour through Mexico’s rich cultural heritage in this spectacular South-of-the-Border fiesta!